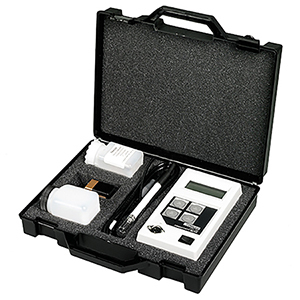 The model CDH-280 conductivity meter is a basic, simple-to-operate instrument with four user-selectable ranges. It features automatic temperature compensation, a fixed 2%/°C temperature coefficient and a rugged splashproof enclosure. The CDH-280-KIT is a complete kit including a glass conductivity cell with an integral temperature sensor and cell constant of 1.0. The meter measures from a low range of 0 - 199.9 µS/cm up to 0 - 199.9 mS/cm. Both dip and flow cells with cell constants from 0.1 - 10 are compatible with the CDH-280. These sensors are available with glass, epoxy or polymer bodies.